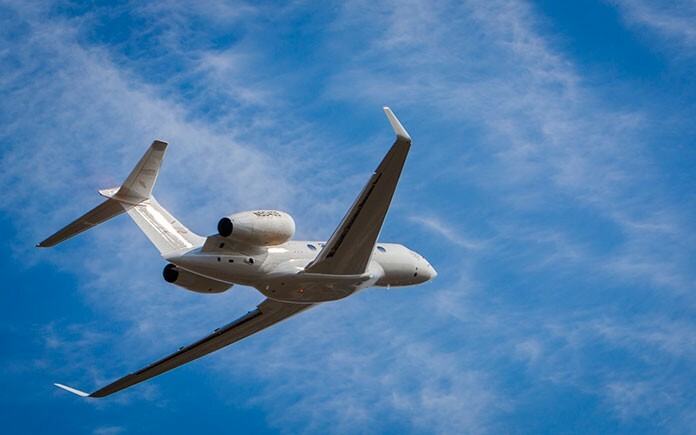 Gulfstream announced that the fourth Gulfstream G500 test aircraft, T4, has completed its first flight and officially joined the G500 flight-test program. The G500 took off from the Savannah-Hilton Head International Airport at 9:47 a.m. on Saturday, Feb. 20, with Flight Test pilots Eric Holmberg and Brian Dickerson at the controls. Flight Test engineers Dominic Pompeo and Mark Mondt provided on-board test and data analysis. The aircraft climbed to a maximum altitude of 51,000 feet/15,545 meters and reached a maximum airspeed of 340 KCAS/Mach 0.925. During the 3-hour and 17-minute flight, the crew exercised all primary flight control systems, performed functional checks of air data and cabin pressurization systems and completed a series of engine performance measures. The aircraft landed back in Savannah at 1:04 p.m. local time. T4’s first flight represents a milestone in the aircraft’s development program. For the first time, Gulfstream has integrated a team of Product Support maintenance technicians with the Flight Test team to follow the aircraft through manufacturing and flight testing. The integrated team performed all the modifications and testing required to prepare the aircraft for first flight and will continue to lead it through testing in support of Federal Aviation Administration type certification in 2017. One of five G500 aircraft involved in the flight-test program, T4 will be used to test avionics, flammable fluid drainage, water ingestion and select systems (water/waste, lighting, fire protection). It will also perform flight standardization and operations evaluations. T1 is focused on envelope expansion; T2, on flight loads validation as well as aircraft performance and systems testing; and T3, on the all-new Symmetry Flight DeckTM. The fifth aircraft, P1, has been delivered to the Savannah Completions Center, where it will become a fully outfitted production aircraft that will be used to test the interior elements as well as the integration of aircraft systems with the passenger experience.